ARGYLE, TX — Join Dallas All-Pro Tight End Jason Witten at the Citi Jason Witten Football ProCamp. The ProCamp will take place on Saturday and Sunday May 16– May 17 at 2015 at Liberty Christian School located at 1301 US 377 in Argyle, TX. for Boys & Girls, Grades 1 to 8. Source: Procamps. Throughout the camp Jason Witten will offer tips and instruction, highlighting the finer points of football. Participants will experience various stations specializing in fundamental football skills and will participate in touch football games. Participants will be placed in small groups according to age to ensure that each child gets maximum instruction. Watch the following video where Dallas Cowboys tight end Jason Witten is speaking with ESPN about the Cowboys season, Jerry Jones, jersey sales, and interesting facts about himself. 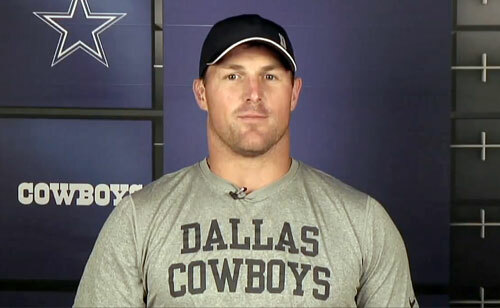 Tight end, Jason Witten is a 8-time Pro Bowl selection. He played collegiately at the University of Tennessee. He is one of the most popular Dallas Cowboys players of recent times. Sports Speakers 360 is a booking agent for pro athletes. If you would like to book Jason Witten for a speaking engagement, appearance or endorsement, contact Jason Witten ’s booking agent for fees at 1.855.303.5450.